In late August 1918, Romanian king Ferdinand was mentioned when the German powers were debating on who should rule Poland. Ferdinand was of German origin but chose the oposing Entente when Romania entered war in 1916. 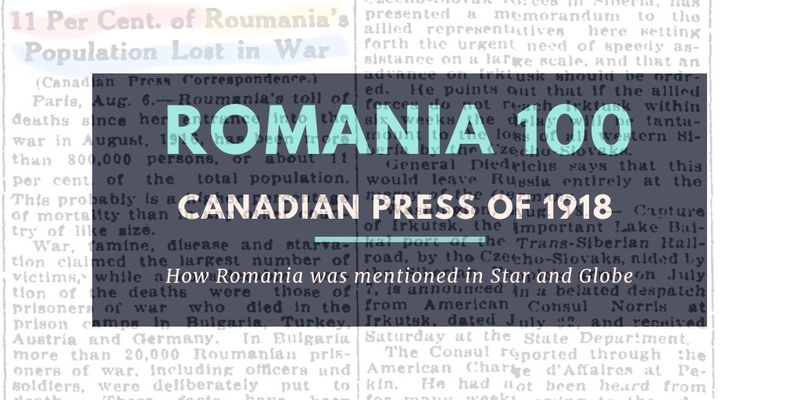 Romania’s peace treaty of May 1918 was mentioned – in Toronto during The Ex – by an MP from Quebec. England was running a trade war as well against Germany. Romania was deemed to be under German influence from that perspective. Romanian king never signed the peace treaty with Germany. That would allow him, three months away from the end of August 1918, to re-enter war as a beligerant nation, leading to the formation of Romania’s modern state. Posted in English blog and tagged as archives, August, Canada, featured, historical, history, King Ferdinand, Ontario, Romania, Romania 100, roumania, rumania, tags, the globe, The Toronto Daily Star, Toronto, world war 1, world war I.